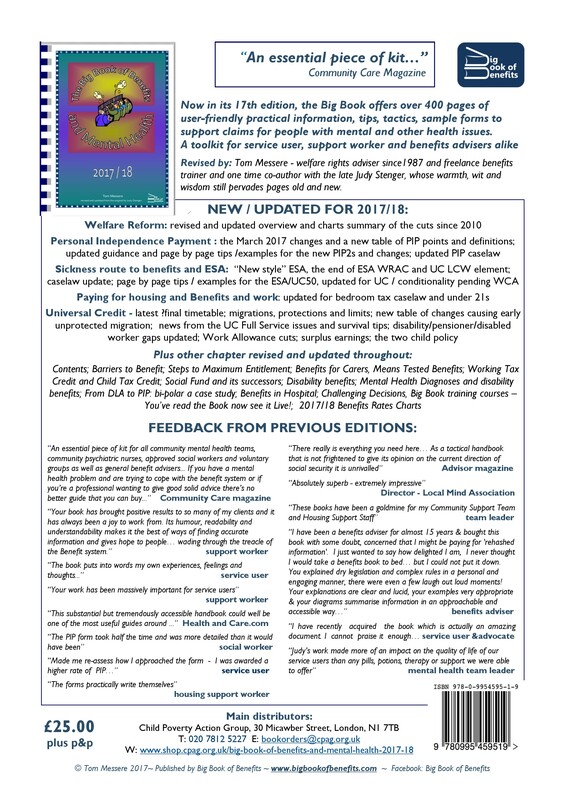 The Big Book of Benefits and Mental Health 2 018-20 was published in early November 2018 . This latest edition has the usual mix of friendly guidance, practical tools, example forms and effective supporting letters. Revised and updated throughout, but with the biggest changes in PIP and Universal Credit , with the Government forced to rethink after Court rulings on their disability discrimination in both areas. We do truly apologise for the lateness of this edition , but we are not at all ashamed about the Book itself ; it can hold its spine tall against previous editions 🙂 . It is also smugly up to date after an unusually busy Summer for benefit changes. And it comes with the added value of being an 18 month edition with free online updates to April 2020. As a result the book has grown to 436 pages. But despite this, paper prices rising – another Brexit effect – and the added value of a longer life and free online updates, we are holding the price – for the third year running – at £25.00. That does mean us taking a bit of a hit and a risk. Its by way of an apology for our lateness, while understanding that life is tough for so many of our regular readers too . Why isn’t in the usual annual edition this time? b) it covers a longer period as we run as a 2018-2020 edition , with a shelf life of some 18 months. During this time free updates will be posted on this website for people to download, to keep your copy refreshed and up to date. This idea – a longer shelf-life with online updates – was worth exploring anyway – it has both pros and cons both for you , O gentle readers – and us But it was the only way to offer a Big Book this year, as we had gone far too late for our usual annual edition. We are truly sorry for having having run late, but hope you have found it worth waiting for. There are silver lining to the cloud of our disgraceful tardiness though, as we pick up on some important changes over the summer for PIP and Mental Health, and as we plan ahead for next time. After a big year for changes last time, we were looking forward to gentle updating and ou r earliest ever availability for the new 17th edition . But late changes to PIP points, a new PIP2 form and more evidence emerging for re-opened enquiries into the coaolition of chaos and confusion in UC Full Service areas – strong and stable it ain’t 🙂 – all meant we were writing and checking into the wee small hours again. Publication will now be in May and we will post again to confirm copies are on the shelves. Next year, we will sharpen our quills earlier :-). Read the book? Now, see it Live 🙂 : If you like the book – or are thinking of ordering several copies – why not check out our linked linked Big Book training. See our Training page – here – for more details. 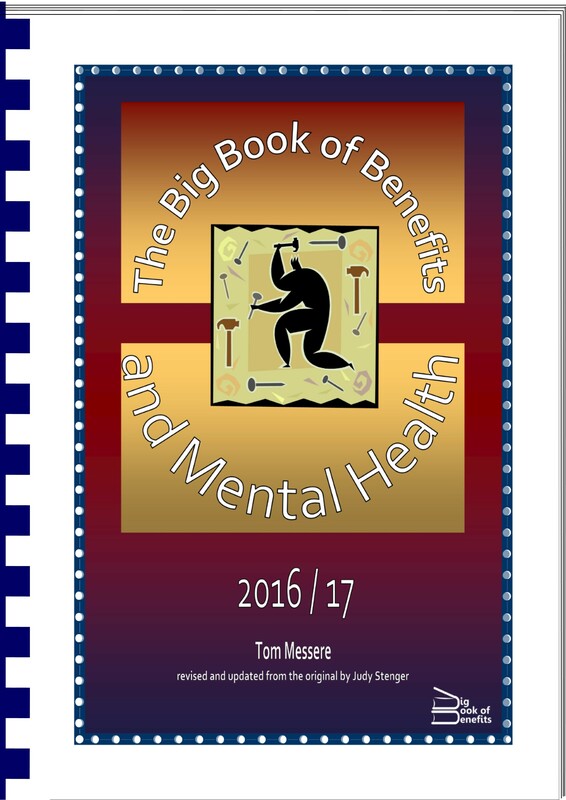 The new edition of the Big Book of Benefits and Mental Health is selling like hotcakes! It is available from w ww.cpag.or.uk/bookshop/bbm. So order your copy now before they all go :-). Welfare reform changes – taking the summary of recent and forthcoming changes right up to the Election . As promised an update for the Summer Budget changes is available from our downloads page. Universal Credit – latest developments on the timetable, top tips from the pilot areas, updated illustrations of the disability gap and new illustrations of the disabled worker gap. And the strange world of surplus earnings rule that starts in April 2016. 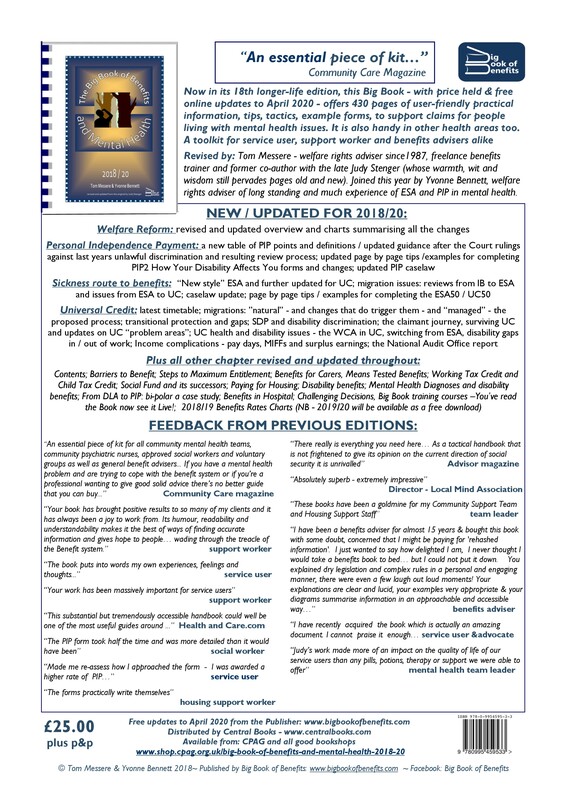 Alongside all that is new sit our usual chapters all revised and updated: Contents, Barriers to Benefits, Three Steps to Maximum Entitlement, Welfare Reform Changes Summary, The Sickness Route to Benefits (including page by page guides/sample pages to completing ESA50s, supporting letters, medicals), Benefits for Carers, Means-tested benefits in Working Age , Pension Credit, Tax Credits, The Social Fund, Universal Credit, Disability Benefits: AA, DLA and PIP, Mental Health Diagnoses and disability benefits, Help with Housing Costs, Benefits and Work, Benefits in Hospital, Challenging Decisions and an easy glance 2015/6 Benefits rate chart. Some older chapters have had to be left out, but are still available as free downloads from the downloads page, These will also give you an idea of the Big Book approach in the current chapters. 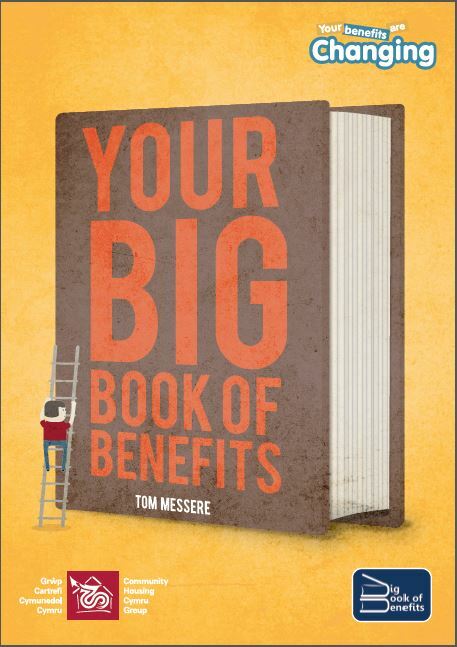 You will also find a set of excerpts from this year’s Big Book and the promised Summer Budget update. 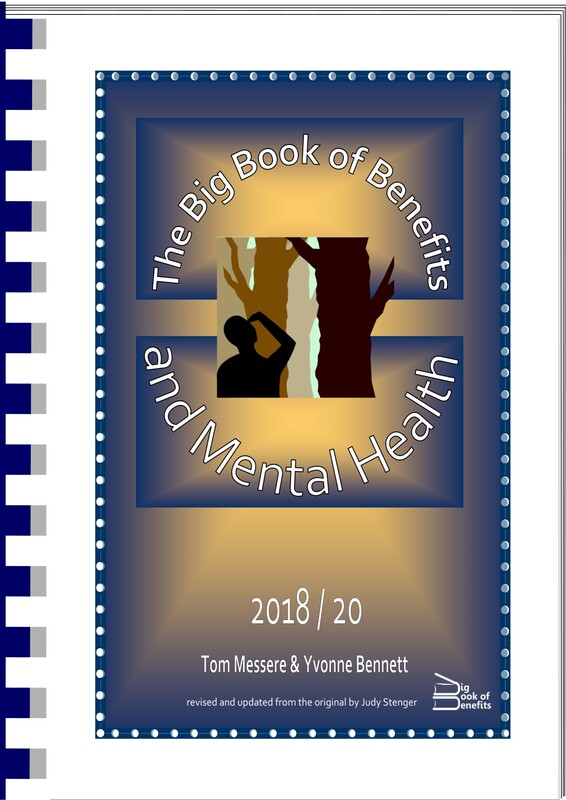 We are proud to announce the birth of the 14th edition of the Big Book of Benefits and Mental Health, with the first batch wending it’s way on to the shelves of our new main distributors at CPAG. book has been revised thorough all its chapters. You can get your copy from http://www.cpag.org.uk/bookshop/bbm. Despite the growth in size, the book is on sale at a very reasonable £20. Attendance and Allowance and DLA: more help and sample pages when filling in forms. Paying for : changing Housing Benefit, the “bedroom tax”, help with mortgage interest and Universal Credit housing costs element. Alongside all the new sit our usual chapters all revised and updated: Contents, Barriers to Benefits, Steps to Maximum Entitlement, Welfare Reform Changes Summary, The Sickness Route to Benefits (including page by page guides/sample pages to completing ESA50s, supporting letters, medicals), Benefits for Carers, Means-tested benefits in Working Age, Pension Credit, Tax Credits, The Social Fund, Universal Credit, Benefits in Hospital, Challenging Decisions and an easy glance 2014/5 benefits rate chart. Read the Book? Now see it live! We have courses and we will travel. You can see a selection of training courses on page 360. Or visit our training pages. We hope though the new edition will still be be a trusty friend in these very difficult times. Good luck and may you feel the benefit!